The Visual Studio 2005 Web Application Project Model is a new web project option for Visual Studio 2005 that provides the same conceptual web project approach as VS 2003 (a project file based structure where all code in the project is compiled into a single assembly) but with all the new features of VS 2005 (refactoring, class diagrams, test development, generics, etc) and ASP.NET 2.0 (master pages, data controls, membership/login, role management, Web Parts, personalization, site navigation, themes, etc). 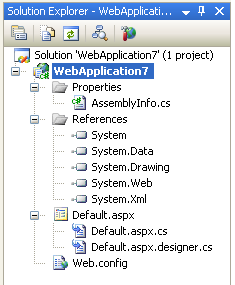 Today we released the V1.0 release of the VS 2005 Web Application Project option. You can learn about it here, and download it here. You should then check out the tutorials on this site to learn more about it and how to use it. You might also want to keep an eye on my blog -- where I'll be posting updates about it regularly. This forum is the best place to ask questions or get get answers about the VS 2005 Web Application Project option. Click here to to download the VS 2005 Web Application Project V1.0 Release.